For the students of agriculture, biotechnology, food technology, and microbiology. We are offering 400 positions for research project internships. Biobritte Agro company is involved in Production of mushrooms as well as research and development in mushrooms. 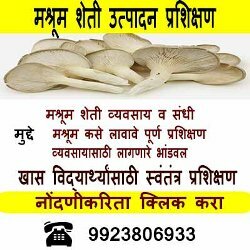 Our company primarily focusses on Biochemistry and Molecular biology aspects of mushrooms. However, we are not limited to that. Innovative projects will receive recognition and you will get monthly stipend for this projects. You will have chance to work with mushroom experts. Mushroom projects will be published in international journals. Complete support from research topic selection to thesis writing.